Looking for inspiration on the best ways to enjoy nature with your toddler? It isn’t too late to get outdoors and enjoy the last days of summer. Outdoor play and exploration is vital for your little one’s development. Fresh air and adventures are what summers should be about for kids. However, after weeks of trying to come up with new and exciting ideas to keep them entertained, you may be struggling to find inspiration to get you through those final weeks of the season. If you’re desperate for new and exciting nature activity ideas, below you’ll discover some of the best ways to enjoy nature with your toddler this summer. Your toddler is almost guaranteed to love this idea as it combines three things they likely enjoy – insects, exploring and learning. The great thing about insect spotting is there are so many methods you can use, enabling you to tweak it a little and do it a little differently each time. So, it’s an activity that you can do numerous times throughout the summer. You can also do it anywhere, even your own back yard. However, if you really want to make it enjoyable, it’s a great idea to head to your local park or woods. Look underneath tree trunks, leaves, branches and stones and you’ll be surprised by the number of insects you discover. Catch, Identify And Release – You can pick up cheap bug catchers which enable you to temporarily house the creepy crawlies you find. After catching the insects, you and your toddler can then identify the different ones and research a little more about them. Then, release them back into the wild. The Tick-Sheet Method – Before heading out on your insect spotting adventure, write down the insects you’re likely to come across. As you and your toddler find them, simply tick off the ones you’ve spotted. Then take a look at the sheet at the end of the activity to see how well you did. Insect Education – If you’re not loving the idea of catching insects, you can simply watch the creepy crawlies together and talk about things such as what they eat and where they live as you watch them. These are just three methods you can try out. Your toddler will love finding and learning more about the different insects they discover. Like babies, toddlers love sensory based activities. Make the most of the summer months by getting out on a sensory walk. The woods are the best place to partake in this activity as there’s all kinds of nature to see, smell, hear and feel. Let your little one get close to the plants and trees. Allow them to touch and smell the plants and teach them more about each one you come across. You may need a reference book to help you out if you aren’t overly familiar with the different types of plants, flowers and trees. Tell them to listen to the different sounds such as the birds cheeping or the leaves rustling in the breeze. With this activity, it’s best not to plan ahead. It’s more exciting and enjoyable if you go with the flow and not knowing what you’re going to come across next. This is a fantastic activity for times when you crave a little peace and quiet. If your toddler has been driving you crazy and they’ve been a little too hyperactive, cloud spotting is guaranteed to calm them down. To do it, simply lay on the ground with your toddler and look up into the clouds. Then, see if you can spot different shapes and objects. This is a great way to let yours and your toddler’s imaginations run wild. It’s something you’ll both enjoy, while it also gives you a chance to relax. There’s something mesmerizing about watching the clouds slowly drift by. There are a lot of collectables in nature which you can pick up and either display them in the home, or use them in craft projects. Wherever you’re heading this summer, there will be something you can pick up and take home with you. If you’re heading to the beach, collect shells, rocks and bleached sand dollars. In the woods you can collect leaves, pinecones, acorns and small twigs. Take a box with you, then when you get back indoors you and your toddler can examine everything you’ve found. Again, you can use this activity as a learning opportunity. Tell them a little about each object before using them to create unique crafts. This may be the simplest idea on the list, but it’s also one of the most enjoyable. Hill rolling proves you don’t have to spend a dime to have fun with your toddler. Simply find a hill, lay on your tummy or your side, then roll to the bottom. Now, as fun as this activity can be, it can also be potentially dangerous if you don’t choose your hill wisely. Toddlers are only small, so it’s important to avoid choosing a hill with a very steep incline. You’ll also want to check out the area you’ll be rolling down to make sure there’s no sharp stones or objects that could hurt you. Once you’re sure it’s safe, take it in turns to roll down the hill. You’ll be surprised how much fun you’ll have with this simple activity. Both you and your toddler are guaranteed to have plenty of laughs! 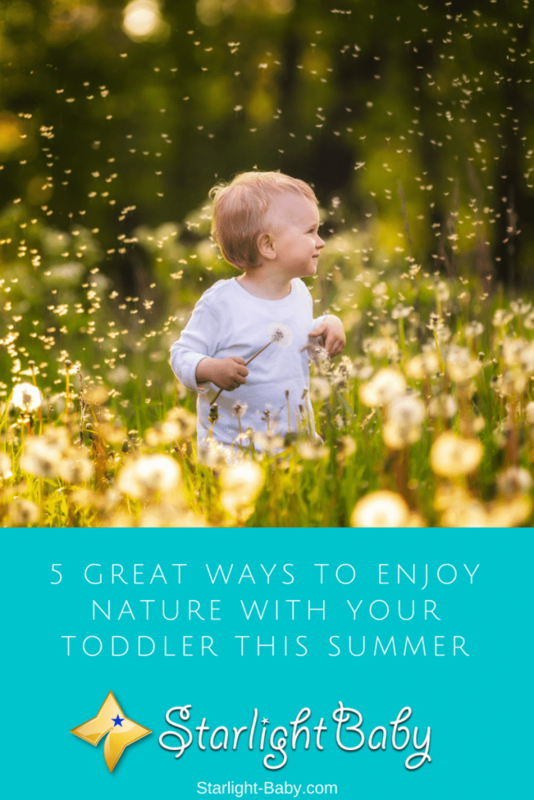 The above are just five great ways to enjoy nature with your toddler this summer. There’s still plenty of time to get outdoors and enjoy the last of the summer weather. You can even partake in these activities during fall too. With each new season, nature changes, so it’s good to go out and compare the different plants, insects and leaves. Overall, nature based activities are one of the best ways to spend time with your toddler during the summer months. Have you got any of your own nature activity ideas? Share them with us below. I can confirm that the insect hunting is a really fun and educational activity. We did it just the other day – we have a huge meadow nearby with some woods near its end and we decided to go find some bugs. We had an amazing time and the whole family could participate. Our son loved it! He was ecstatic when we found some insects and when we explained to him exactly what kind it was, etc. I highly recommend it because it’s perfect for the summer days. That sounds really awesome, Jane! So many people still need to travel far to get in touch with nature, but in your case, it’s just a few steps away. I’m sure you all had fun and had a great bonding time. Moments like that will always be remembered by your son, and he will look back to it with a warm smile on his face — you know, the “best part of childhood” thing. Hello, i have a toddler and we tried doing cloud spotting because he likes spotting animals and different shapes and he really enjoyed it. We also tried hill rolling and he kept laughing even on our way home.This post is really great and helped me a lot.Cheers. The things you mentioned, Alex, made me remember days when my kids were still toddlers and would laugh at the simplest things. I miss those days. That is why I love babies so much… they’re so easy to get along with when they’re happy, and their laughter could actually help relieve the stress of parenthood. I probably went on 10 different frog hunts this summer. The kids got a kick out of trying to catch the quick little hoppers, and we always ended up laughing and a little muddy. Letting the frogs go again was always their favourite part as watching them swim or hop away is fascinating. Next spring we plan on catching a few in the tadpole phase and watching them grow before letting them free again. We also had the kids plant their own little garden (With lots of help) and they loved being responsible for watering. It has been a fantastic way to get a 3 year old to eat veggies as they’re so involved in the process! Yeah, I agree! Every toddler must have their physical exercise like to go outside and making fun with nature around him. It makes the kid become more adaptable and susceptible. Summer is the best outdoor activities that he can play around together with the kids. I always have fun while little going out with my parents to have a feel of nature at the field close to us and those moments are the one I really missed from my childhood. The moments when they play with me and show me things that are around the field such as insects and all that. These moments are the one every parent should use to make their babies having that good feeling about the environment. Thank you for highlighting the ways to make such experience worthwhile. Insect hunting is my favorite activities to engage in during summer, the spotting, chasing and actual catching and bottling/jarring them up is very thrilling to me. I never miss out on insect hunt any summer season, seriously I’m looking forward to the next summer and see the variety and specie of insects that we are going to catch. Summer please do and come fast, we are eagerly waiting for you (LOL winks). I always enjoy outdoor activities with my kids because it helps them to express themselves and be free. Being too cooked up inside the house isn’t a healthy way to bring up a child. They need the outdoor life in order to balance their perception about life even though they are still kids, they still have a mind of their own. You made a very good point @Emmaz about always being indoors with kids. It’s good for parents to give them some outdoor time with because it helps them socialize as well as develop well.